On Monday, Pizza Hut announced it was bringing back the pizza that stares at you, officially known as Cheesy Bites Pizza, for a limited time. It may be unthinkably delicious; I do not know, and never will, because that thing will always look like the Pale Man from Pan’s Labyrinth to me. It just keeps looking at you, you know what I mean? It can see things, that pizza. That’s not right. 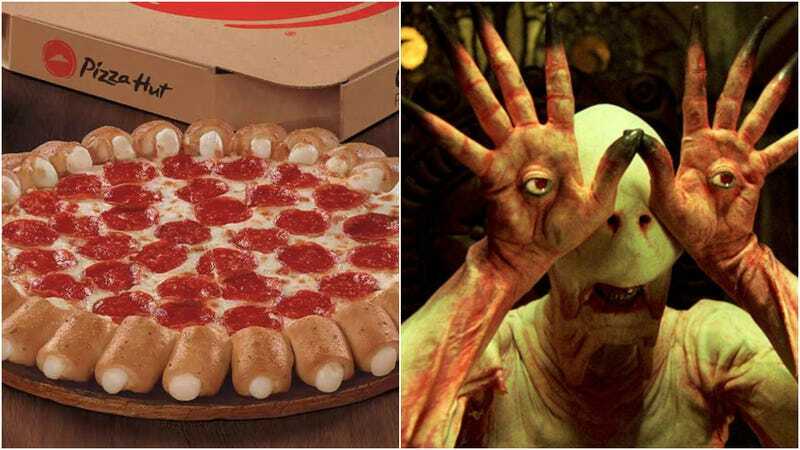 Pizza Hut has dragged this monster out of the labyrinth before. Last year, it was resurrected in honor of Spider-Man: Homecoming; it previously slunk out of the sewers to celebrate the release of a Teenage Mutant Ninja Turtles movie; once they did it with hot dogs instead of cheese. It’s a whole thing. And it’s back again, this time because apparently there are no sports today. “We always say that Pizza Hut and sports are a perfect match–so on a day with no sports, we are getting creative to bring some entertainment to fans,” said Zipporah Allen, chief marketing officer, Pizza Hut. First of all, it’s true that there’s not much going on in the world of sport today. Yesterday was the MLB All-Star Game, so there’s no baseball. Last night my beloved Portland Trail Blazers defeated the Los Angeles Lakers in the NBA Summer League Championship, so that’s not even an option. No hockey. No football. No, um, golf. But there are still sporting options for the discerning viewer. The World Cup is over, though there’s still some soccer to watch. It’s not even close to a slow news day, basketball-wise. And there are not one but two WNBA games today, Pizza Hut. Get it together. Still, it seems that Pizza Hut is all about the NBA, NHL, NFL, and MLB, perhaps with a few fast cars thrown in the mix. The absence of these organizations from TV for one stinkin’ night seems to be reason enough, in Pizza Hut’s mind, to reach down into the darkest corner of its pizza cellar, drag out the “28 crowd-pleasing, cheese-filled bites” that converge and form an unearthly replacement for a traditional crust, slap some electrodes on said “crust” and wrench it, screaming, back to life. This pizza is available for a limited time only, after which it will bed back down in its pits, awaiting the next lackluster excuse for promotion. The next Beyoncé record—she’s also a crowd-pleaser, get it? Part two of Infinity War? The day after Christmas, because it’s “No Santa Day”?